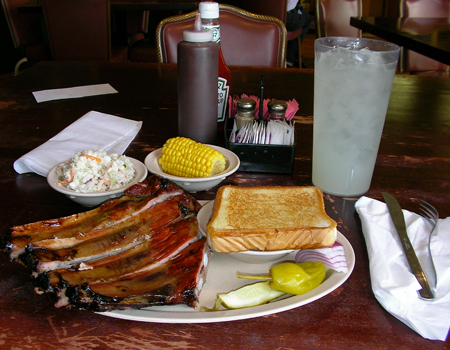 A perfectly cooked meal of BBQ ribs from Mojos in Tulsa Oklahoma. Such a perfect meal. This tasted sooo good. Wow, that is a HUGE piece of meat. No way I could eat all that! Welcome to the photo hunters! I do not remember you doing this before. I think this is my 4th one. I just started recently. Thanks for the welcome. Wow, that’s a great lookin’ meal!! Tho, may I request my corn off the cob and no cole slaw? hehe Nice photo. p.s. I voted for you on the blog for a year gig. Thanks for stopping by. That was one of the best road meals ever. Thanks a lot. I am slowly moving my way along the list, onwards and upwards. looks like a wonderful meal!! great shot. That’s a lot of good looking food! Thanks Bridget, I enjoyed that meal very much. Hey Bobbie, that was a very tasty plate of food. Good lemonade too. Angelika, It was very good. I wish I could have some right now. delicious! great photo for this week’s theme! Thanks for the comment and the visit. That meal was delicious. Those ribs look sooooo yummy! They were delicious, Autumn. Thanks for the visit. It was a very delicious meal.